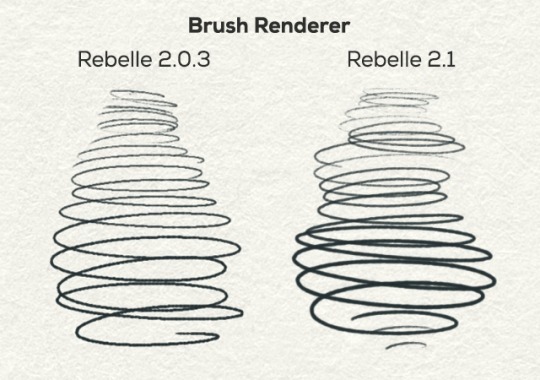 Rebelle 2.1 is out now, featuring many new fantastic additions such as improved brush engine, amazingly realistic watercolor behavior, group support for brushes, papers & stencils, handful of new shortcuts, tracing layer adjustments and much more. 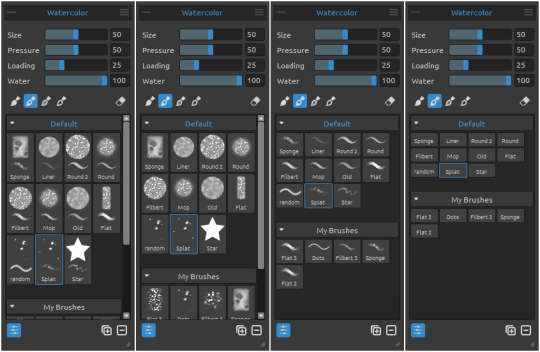 Water slider of all wet tools is improved too - raising evenly from value 1 to 100 as opposed to older Rebelle versions when high water sensitivity was more notable at lower slider values. Autosave - (Finally!) From Rebelle 2.1 your work will be automatically saved and hence protected from any loss. You will be able to find the last 20 versions of your work in the “Autosave” folder accessible via Help menu -> Show Library folder. You can set your custom timer in Preferences panel. User Interface - Changes have been applied to Rebelle user interface as well. The UI is now more compact, you can adjust the size of stencils and color icons; the brush icon thumbnails can now be changed to save space in the brush list - choose to show only image, stroke or brush name. You can quickly and easily copy & paste brushes between tools - either with keyboard shortcuts or via right-mouse button menu. Categories - We made it easier to organize your creative assets by implementing support for groups. What does it mean? From this version you can create your own brush, stencil and paper groups, rename these groups, re-group within groups and much more. What is more, now you can conveniently save and load your custom UI layouts using Import / Export layouts option in the Window menu. You can also lock your current interface so that you don’t undock or merge any panel by mistake. 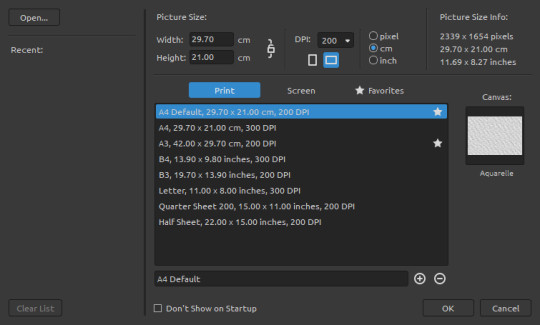 New Artwork Interface has a new design with ‘Print’, ‘Screen’ and ‘Favorites’ canvas sizes, list of recently opened files and “Open…” file button. Modified Image Tracing - Tracing an image and picking the colors while painting is now easier with the practical Tracing Layer (T) and Influenced Layer ( • ) selection. 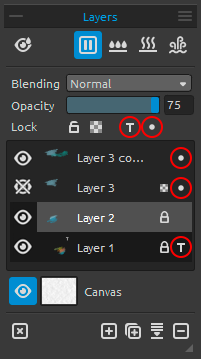 You can pick the Tracing Layer with “ T ” icon from the Layers panel and then choose layers into which you would like to paint with the “ • “ icon. You can anytime turn on/off the Tracing or Influenced Layer with a single click. Improved Color panel - Now the option for setting number of colors when creating set from image is available - you can choose between 4, 9, 16 or 25 colors. We also made it possible to create color set from a text file (in *.txt or *.colors format). In Color Panel a button for secondary color has been added - we had this feature before and decided to bring it back to the newest update. With it you are able to switch between primary and secondary color very easily which comes in handy when working with very few washes. Keyboard shortcuts - We added some useful keyboard shortcuts as well as new shortcuts to Preferences panel so that you can set your own. Canvas zooming is now available also with keyboard shortcut (“Z” + mouse move), rotate canvas is now possible with “R” shortcut. You can set your own shortcuts in Rebelle 2.1 for “Invert stencil”, “Flip stencil horizontally” and “Flip stencil vertically”. Custom keyboard shortcuts can now be saved as an .xml file for future reference. 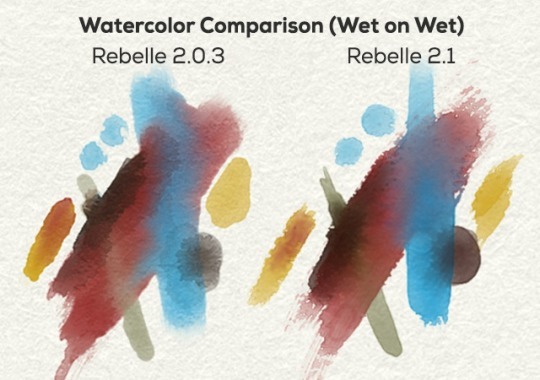 You can get Rebelle 2.1 update from our Download page or directly from within Rebelle’s menu: Help -> Update to 2.1. The update is free for all Rebelle 2 users. You are welcome to share your opinion on the new update. You can do so various ways: either from Rebelle’s Help menu -> Send feedback or more traditionally - via email at support [at] escapemotions.com. Tell us what you like, dislike and what you would love to see in Rebelle next. We value your opinion and are always super thrilled when a new feature suggestion lands in our Inbox, so don’t be shy and speak up :) We’re looking forward.